New York, NY (CHELSEA) Garvey|Simon Art Access is pleased to announce Material Grid, a group exhibition featuring works by Christopher Wade Adams, Marietta Hoferer, Tamiko Kawata, Michael Kukla, and Susan Schwalb. The exhibition will run from September 4 – October 4, 2014. The Opening Reception will take place on Thursday, September 11, from 6-8pm. 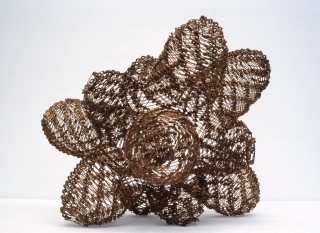 The five artists in this show each use a variety of unusual materials in conjunction with the formal device of the grid. The grid acts in the supporting role of anchoring the compositional structure. Texturally rich and wide-ranging materials such as ceramics, safety pins, packing tape, contrasting color, and the lost-art of metalpoint drawing combine in this exhibit to create a varied, yet visually cohesive installation. The works within reveal a bravura combination of precision and experimentation. Marietta Hoferer’s monochrome works on paper are set in space with faint grid lines that fix her adhesive collages in space. Hoferer builds intricate drawings, solely composed of fortified strapping tape on paper and graphite. Cut by hand and laid down in infinite patterns, these translucent fractals create nearly symmetrical systems of intersecting horizontal and vertical lines and shapes. A virtuoso of her medium, the artist continues to study a wide variety of types and brands of commercial adhesive tapes, and appropriately selects what she knows will produce a particular pattern, luminescence or patina (some of it changes color over time). Using multiplicity to arrange the parallel lines inherent in a simple safety pin, Tamiko Kawata weaves together an undulating grid of sculptural metal lines. Kawata enjoys finding various, everyday materials to make her visual diary. Experimental in nature, Kawata regularly incorporates such mundane, yet personal objects like safety pins, toilet paper, pantyhose and chewing gum into her both her installations and sculptural work. Michael Kukla’s trippy and obsessive compositions consist of three-dimensional hexagonal grids in strongly contrasting colors. Themes of geometry, structure, surface and manipulation combine to produce a fractal field of infinity. His sculptural work is carved from materials as wide-ranging as wood, stone and insulation board. His work comments on the grid-like structure that exists in nature on a cellular level. Susan Schwalb’s polyphony series is composed of multiple grids overlaying one another. Derived from a musical term, polyphony indicates simultaneous lines of independent melodies. Schwalb – who works strictly in metalpoint drawing - layers a variety of metals to create grids of interlocking squares on a field of brightly colored gesso. When viewed from various angles, a mystical and ephemeral optical illusion is revealed. Christopher Wade Adams’ wall-mounted ceramic sculptures are installed in a loosely grid-like formation for this show. With a hauntingly primordial presence, his installations suggest collections of rare specimens from a phantasmagorical museum of science or natural history. The grid, a tool of measurement, is the perfect foil for this self-taught artist with a background in science. Adams’ abstracted series of biomorphic forms are each created with a formula of 18 appendages per sculpture. His work is a riff on biological concepts such as speciation, convergence and mimicry to generate aesthtic novelty. A fearless virtuoso with ceramic construction and glazing, he stretches his clay into long twisting tendrils or flattens it into leaf-like, crinkly planes. 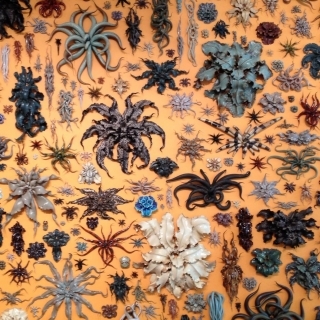 Tentacles and knots seem to creep across the wall – a sea of colors and textures. His surfaces run the gamut from pristine, gloss-white porcelain to brightly colored with textures including bubbles, crackling and droplets. Garvey|Simon Art Access is a contemporary gallery with a special focus on drawing and works-on-paper, as well as artists whose work bridges the gap between art, design and craft making. Our art advisory service, founded in 1999 by Elizabeth K. Garvey, specializes in American, Modern, and Contemporary Art. NEW Gallery hours: Wed-Sat (OPEN LATE EVERY THURSDAY): Wednesday 12-6; Thursday 12-8; Friday-Saturday 12-6. Open by appointment only Sunday – Tuesday.